This post is by Jia Li, ecommerce marketing specialist at InterCultural Elements. From its base in Germany, InterCultural Elements helps online retailers expand their ecommerce sales internationally. Japan has become an increasingly attractive target for online sellers around the globe. This is no wonder, as Japan has the world’s third-largest ecommerce market, and one of the fastest growing. In fact, it is estimated that by 2022, the Japanese ecommerce market will be worth over $113 billion dollars. There are certain characteristics about Japan and it’s consumers that also help to make it an attractive market for online retailers. The compact country size and a mature distribution infrastructure helps to create a perfect online shopping environment, as delivery is easy and convenient. Likewise, the mindset of Japanese consumers is important. They value high-quality products and often wish to experience the foreign, and sometimes exotic, lifestyle that imported goods can bring. Social status also plays an important role in Japan and products sold by sellers from the U.S. and Europe are usually considered more upmarket. All the positive facts and statistics aside, this opportunity is not without its challenges, as expanding to Japan can be much more difficult than other countries and requires a relatively delicate approach. 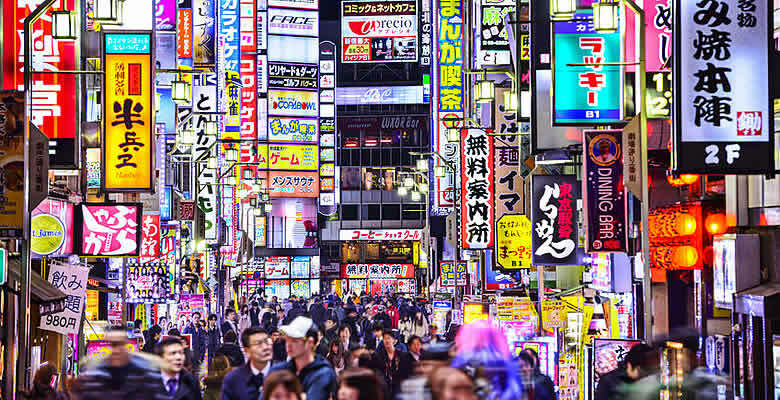 So, in this article I’m going to cover some of the key considerations for expanding into the Japanese market and reveal what online retailers need to do to kickstart a successful ecommerce business in Japan. Currently, the largest segment of the ecommerce market in Japan is “Toys, Hobby & DIY” with a market volume of over $22 billion in 2017. Clothing and fashion accessories are among the most popular items purchased online, while sales for food and beverages continue to grow. In general, high quality products and well-known brand names are in high demand. Ranging from Hello Kitty to salt that allegedly brings good luck, the Toys, Hobby & DIY category is the most popular in Japan. Among the most-listed products are animation figures and game characters, with popular subcategories including stationery, lucky charms and video games. The second largest segment in the Japanese ecommerce market, is furniture and appliances, with home-décor and housewares being the biggest sub-category of that. You can also find the traditional Japanese Tatami (a type of floor mat made with rice straw) in this category. While most Japanese consumers still find themselves going to brick-and-mortar stores for their grocery shopping (especially fresh goods), buying snacks and foreign delicacies online is a common practice. This is primarily due to convenience and the ability to access a broader range of products. Health supplements from the U.S. and French skin care products are in particularly high demand. Although Japanese buyers prefer to try out electronic products in-store before making a purchase, they also appreciate the customer reviews and price transparency that ecommerce has to offer. Like anywhere in the world, clothing and fashion accessories is an ever-growing segment in Japan. It’s very often the category with the most listings and sub-categories on marketplaces. Amazon Japan and Rakuten are two of the biggest marketplaces in Japan. Foreign sellers can find Rakuten Japan a challenge due to its relatively strict setup requirements and often favor Amazon Japan. If you sell in the fashion, accessories or apparel categories, then it might be worth checking out ZOZOTOWN, a fashion marketplace which has gained a large number of users in recent years. With its American roots, this is usually where foreign sellers start when first selling to Japan. Like any other Amazon marketplace, Amazon Japan has the same interface and is available in Japanese, English and Simplified Chinese. This lowers the barrier of expanding to a new country with a very distinctive culture such as Japan. Currently, Amazon Japan offers over 200 million products and is steadily growing in popularity among Japanese customers. Celebrating its 20th anniversary this year, Rakuten is the largest online marketplace in Japan, with over 227 million products listed on the site. Most product categories have potential on Rakuten. In fact, if you take a look at The Best-selling Products, you’ll find almost everything. Rakuten offers lavish images, overwhelming promotions and a loyalty point system. Rakuten offers a traditional shopping experience which you don’t normally expect to see in ecommerce. It has lavish images, overwhelming promotions and a loyalty point system (the Rakuten Super Points Program) that encourages shoppers to buy more. In terms of on-boarding, foreign sellers might find Rakuten a bit intimidating. Not only is Rakuten Japan only available in Japanese, but sellers who wish to sell on Rakuten Japan also have to create an individual store page. This serves as a virtual store within the marketplace. When a customer searches for your products, Rakuten will first show your product, and then, when the customer clicks on the product, they’re then taken to your store page. So, it’s important to make the best of setting up your virtual store in order for you to build your brand effectively. Ryan Miller from Rakuten wrote a detailed post about selling on Rakuten Japan for Web Retailer in September 2016. Founded in 1998, ZOZOTOWN is the largest fashion marketplace in Japan. It carries over 200,000 fashion items, including big brand names such as Urban Research, and nano·universe. The marketplace has experienced rapid growth in recent years and have just started serving international customers. However, the main site is only available in Japanese at this stage. Beside fashion apparel and accessories, customers will also find kitchenware and interior decorations on ZOZOTOWN. Japanese culture values loyalty. Japanese shoppers are risk-averse and seek brands they know they can trust. Higher prices for these brands are accepted and even appreciated as a reassurance of product quality. With that in mind, sellers who focus on non-branded products should be a little more patient when selling to Japan, knowing that it takes more time to establish trust with the customer and build up your reputation as a foreign seller. Japanese buyers tend to research extensively before making an online purchase. Therefore, working on getting positive feedback becomes the top priority for sellers who are just entering the Japanese market. Sellers will be happy to note that despite the high standards, product returns are relatively low in Japan. This is mostly due to the Japanese habit of sticking to trusted brands, and sellers providing very detailed product photos. As online retailers, you’ll immediately notice the difference when you visit a Japanese ecommerce site. Typically, Japanese marketplaces are busier and more complex than their western counterparts and are heavy on content, with HD photos, professional models and staged settings. Because of this, the minimal design and wide-open space that western sellers are used to may not appeal to Japanese consumers. Presentation of product is crucial to Japanese buyers. Product photos are expected to show all the details of the item so the customers can clearly see what they are paying for. Make sure you tap into the local culture, and consider hiring a professional photographer to take extra photos of your top-selling products. The accepted delivery time in Japan is 24 hours. Regardless of where the seller is sending the products from, Japanese buyers expect to receive their purchases within one day of ordering. There are also sellers offering same-day delivery if the order is placed before noon. From our experience in customer service, Japanese buyers will typically only wait up to 3 days before making a claim for non-delivery. There’s a Japanese saying that translates into “customers are gods” (お客様は神様). This shows the general belief that customers are always right and should be treated with respect and the highest degree of courtesy. It is a good practice to attend to every customer personally, whereas template answers are seen as inconsiderate and a sign of poor customer service. Considering the subtlety of Japanese culture, and the fact that only 3-5% of Japanese speak English, it’s a no-brainer that customer service should be handled by native Japanese speakers. Companies like ours provide customer service representatives to help you deal with Japanese buyers. We ensure all inquiries are answered directly by our representatives in Japanese and we can also manage cases and claims, using our in-depth understanding of Japanese culture. Outsourcing customer service is usually a cheaper option than hiring new staff to handle your Japanese customer service. However, it’s important to help your outsourced team develop a good level of product knowledge, to ensure that all incoming questions and claims can be resolved in an accurate and timely manner. Known as a nation keen on quality and details, Japanese buyers do not compromise when it comes to online shopping. From a Japanese buyer’s point of view, after-sales care is a big part of a buyer’s overall evaluation of a seller. This partially derives from the aforementioned belief that “customers are gods” and it is important for sellers to show they are trying to provide the best for their customers in every way. One Japanese buyer made a claim because the tag on a t-shirt was slightly wrinkled. By mentioning details, we are not just talking about product-related fields, but also packaging, tags and even purchase receipts. One example of what Japanese buyers expect is delicate wrapping and packing of your products as if they were all fragile items. This usually means double or sometimes triple-wrapping a t-shirt, first with a thin sheet of quality paper and then a well-designed box. The packaging would then be finished by placing the product into an elegant paper bag. One of our Japanese representatives here at ICE recalls a claim made by a Japanese buyer, because the tag that came with a t-shirt was slightly wrinkled. While this may not be a big deal for western buyers, Japanese customers see it as a signal of negligence and indifference from the seller. This can lead to potential claims that might result in customer dissatisfaction, negative feedback and eventually distrust in the seller and their products. The key point here, is to ensure that your products and the presentation are top-notch when you try selling to Japan. Sales seasons in Japan are perfectly aligned with the country’s holidays. Shopping for oneself and loved ones is considered a way to celebrate these occasions. Most western holidays such as Christmas and Valentine’s Day are widely celebrated in Japan, and Halloween has also gained huge popularity among younger generations in recent years. Costumes, gifts, decorative items and the “holiday usuals” are among the most popular products during these times of the year. Consumers usually start pre-ordering Fukubukuro as early as the beginning of November. Products found in a Fukubukuro can range from food, to underwear, basically anything that could be associated with good luck are welcomed – so be creative! It’s also worth mentioning that most Japanese employees receive a bonus twice a year in June or July, and December. Embracing the whole concept of “celebrating by pampering oneself”, online sellers can expect a sharp increase in sales during these periods. Like most of the world, Japanese buyers prefer to use cash and credit cards when shopping at brick-and-mortar stores. Mobile payment and digital wallet services are also picking up, as the idea fits into the fast-paced lifestyle most Japanese live. When it comes to online shopping, besides credit cards, Japanese buyers also like to use payment upon delivery. In this case, no upfront payment or deposit are needed. After receiving an order, sellers ship the items and payment is collected from the customer by delivery personnel when the item is delivered. Recognizing the opportunity and planning your expansion into the Japanese market strategically can pay dividends. Sellers need to realize that Japanese customers value a really high level of product information, packaging, delivery and customer service in assessing quality and in making purchase decisions. However, even after optimizing these areas, expanding to Japan can still be more than a handful for sellers from the U.S. and Europe. The language barrier and cultural differences are the biggest obstacles for most sellers, so help from a native Japanese speaker is usually indispensable. With that, we wish you the greatest of success in your Japanese expansion! This post is by Jia Li, ecommerce marketing specialist at InterCultural Elements. Having lived in multiple countries outside her homeland of Taiwan, Jia offers a fresh eye into the world of cross-border trade. How can the Japanese market be good to a US seller when its customers expect their orders within 24 houris? That’s a very good question, I’m glad you asked! It’s true that most Japanese buyers expected their orders within 24 hours. However, from our experience, the desire for quality and unique products often outweighs the delivery time, and customers in Japan understand that there might be extra waiting time for items they want. As a foreign seller, if you don’t have a warehouse in Japan, we recommend you be very clear on your listings about the delivery time. State exactly how long it takes and emphasize on the fact that those items are directly sent from your warehouse outside of Japan. Stick to the delivery time you promised, Japanese buyers like to be informed and expect sellers to keep their words. Alternatively, Amazon FBA provides same day deliveries as well as other delivery methods to satisfy Japanese customer needs. Have a look and see if this might be a solution for your Japan expansion. If you have any more questions regarding expanding to Japan, feel free to contact us directly! Give it a go! Japan is often overlooked as a expansion target. But it’s got so much potential! Good luck with your expansion, and PM us in case you need any help.